Men sing and dances by flowing into a spirit of rhapsodic jubilation, the winner’s trophies held aloft. Some lift their smartphones to film the whole scene. In Europe, men would probably sing: “We are the champions”, by immortal British rock band Queen. But we are in the Kingdom of Saudi Arabia and it is a happily relaxed atmosphere at the Riyadh Arabian Horse Show, a three-days-event. Arabian Horse Show enthusiasts know too well, the most anticipated championship is always that of the senior stallions. The winner is always full of overflowing joy. 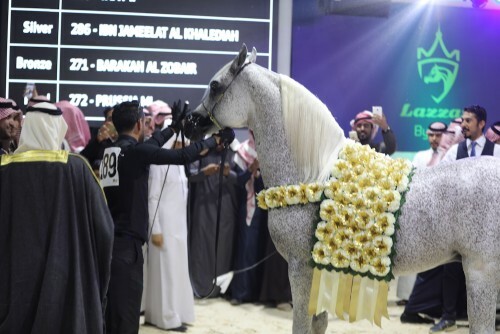 However, this scene in Riyadh was amazing and everybody was happy for Naef Mansour Motab Al Eida'a, proud owner of Gold Champion Senior Stallion Tamy II, a son of champion maker WH Justice. Silver went to Ibn Jameelat Al Khalediah, by Moutaz Al Biwaibiya while the Marwan Al Shaqab son Barakah Al Zobair garnered Bronze. 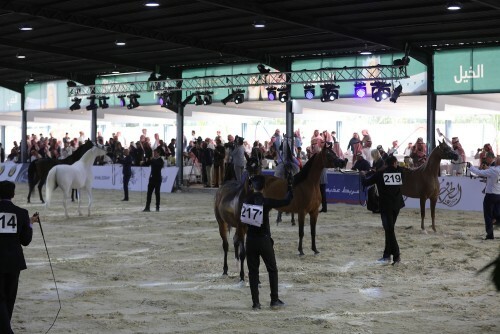 It was again a show where the massive influence of Marwan Al Shaqab and his sire Gazal Al Shaqab became quickly evident. For example, through one of the most exotic and accomplished stallions of this influential sire line, Emerald J. Formerly owned by Al Muawd Stud but now back on European soil with his breeder Christine Jamar, Emerald J is by QR Marc by Marwan Al Shaqab out of glorious Emandoria, by Gazal Al Shaqab. Emandoria herself is one of the most accomplished mares in Arabian horse scene, being World, All Nations Cup and European Champion, both as a junior and senior, as well as United States National Champion, World Cup Champion, and – of course - Polish National Champion Mare. 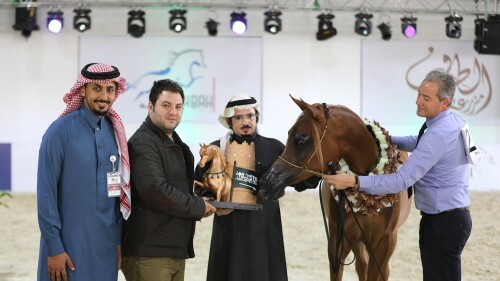 Emerald J is a worthy successor of his great ancestors and sired three Gold and one Bronze Champions at this show: Reem Al Aloush (Gold Champion Yearling Filly), Shahla Al Muawd (Bronze Champion Yearling Filly), Dinar Al Muawd (Gold Champion Yearling Colt), and Equador (Gold Champion Junior Colt). Especially Equador, out of Just So Versace, caused a lot of attention, a lookalike of his sire. The breeder Ryan Bryn Jones from the UK led Equador to Gold for the proud owner Naser Jaser Al Sobaie. An English fan club not to be underestimated followed the age class and the championship to celebrate Equador’s clear victory. The Jareer Al Khalediah son Aali Al Khalediah achieved Silver with his stablemate Wajeh Al Khalediah, by Razi Al Khalediah winning Bronze. Gold Champion Yearling Colt Dinar Al Muawd clearly deserved this win, much to the joy of his proud owner Naif Bin Fahad Bin Abdullah Al Oidah. Sired by Emerald J, Dinar Al Muawd’s dam Maysaa Al Khalediah is by Marquis CAHR, so again the influence of Marwan Al Shaqab. The Excalibur EA son Nabil Alsakab accomplished Silver and Adeeb Al Sayed, by QR Marc received Bronze. Gold Champion Yearling Filly Reem Al Aloush, bred and owned by Abdulrahman Bin Abdulaziz Bin Mohammed Al Aloush, is not only sired by Emerald J. One can also find Gazal Al Shaqab on the female side of Reem’s pedigree. Her dam Ryaanh Al Muawd is by the Gazal Al Shaqab son Stival and traces back to solid Polish lines. Marquis CAHR is also the sire of Silver winner Helwat Al Khalediah out of Halah while Bronze winning Shahla Al Muawd is again by Emerald J. Straight Egyptian bred Kays Al Baidaa is the sire of Gold Champion Junior Filly Dalal AM, proudly owned by Fahad Mohammed Abdullah Alfawzan, however, her dam Ghazalat Al Mohamadia is a double paternal great-granddaughter of Gazal Al Shaqab. The Silver winning filly, Lamya AM is by Eden C and carries Marwan Al Shaqab blood through her dam Lama Al Mohamadia. Resalat Al Khalediah achieved Bronze, a paternal granddaughter of Marquis CAHR – Marwan Al Shaqab. The Gold Champion Senior Mare Scandall Mirage TGS, by Mirage LM and out of Scandallyze TGS, proudly owned by Abdul Aziz Bin Ibrahim Al Bargash, has no line to Marwan Al Shaqab. But Scandall Mirage TGS sire Mirage LM traces back to Ali Jamaal, by Ruminaja Ali – and Ruminaja Ali is also the paternal grandsire of Gazal Al Shaqab. The QR Marc daughter Mawee Athbah received Silver with Khadija Al Khalediah, by El Palacio VO winning Bronze. Special thanks to the organizing team around show director Al Muawd Stud for hosting this amazing event. Arabian Horse Global Network would like to extend our thanks for the excellent collaboration.